We had a massive bank of clouds move in Saturday cutting our Perseid viewing short. Nonetheless, I managed to catch a few meteors before it clouded over and we still had a blast! 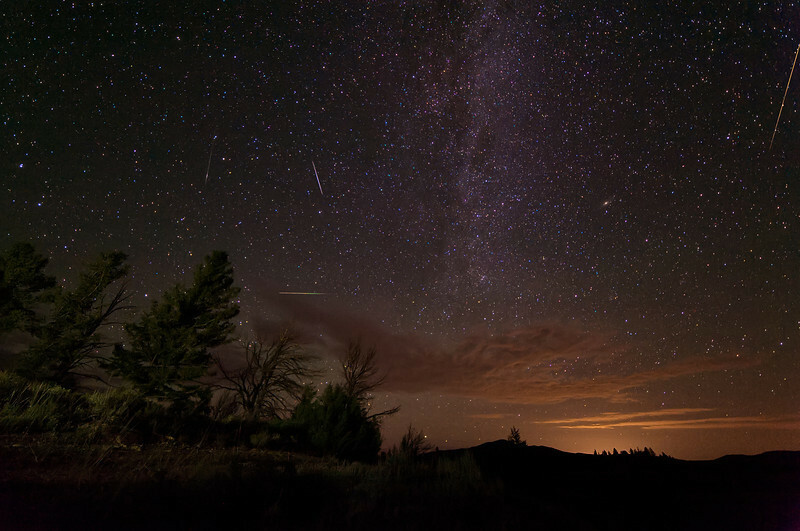 Image notes: this is a composite image combining all the meteors I recorded by the time viewing was no longer possible. I used my new Nitecore EA4W flashlight with a diffuser on to subtly light paint a bit of the foreground to add interest. The orange glow is from Laramie, WY light pollution. Given the paucity of meteors it made me feel lucky I got to see so many the week prior in the dark skies of Nevada's Great Basin country. And I'm pretty sure the base frame I used has a satellite here as well.